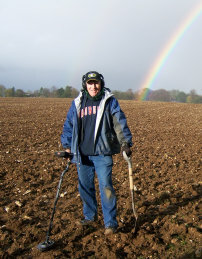 Detecting in England - found that old silver! Detecting in England - Yes, that is snow! My Daughter & I with her first big project! I live in Gulf Shores, Alabama on the Alabama coast....about a mile from the whitest sugar sand beach in the country. It's tough, but someone has to live here. Just don't talk about Hurricanes.....I've been through a few. 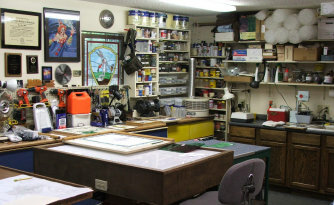 My workshop is in my home, and although cluttered with 20 years of stuff, is about as perfect a workshop as any guy could want. Why do I build glass? I'm too old to start another hobby and I'm too experienced at this to try to be an amateur at something else. I love building stuff.....taking parts and pieces and creating something whole, especially if I can make something different. I don't think I'm an "Artist" in the purest sense of the word. I don't have Divine Inspiration or some unique gift to create magnificient new art concepts. However, I am a craftsman......I can build almost anything ...... given some artistic direction. My attention to detail is really good. When you grow up poor, you learn to fix stuff.....you learn you better do it right the first time.....you sure can't afford to do it again. When I face a new project, I'll agonize over a design, spending countless hours perfecting minor changes, yet, when its time to build, I'm ready to get in there, get dirty, and get it done. 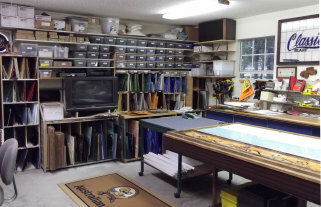 I build quality glass....every piece I build is the absolute best quality I can build, every detail taken care of. I sign each piece because, long after I'm gone, I hope someone will marvel about the quality of a piece of glass with my signature. I graduated from Georgia Tech with a degree in Industrial Management and went into Corporate America for 6-7 years. Realizing I was not a big company man, I've spent the rest of my life as an independent small businessman, first as a Real Estate Broker/Business Broker for a decade and then owning a group of small retail stores for another two decades. I've enjoyed building several businesses ....so my artistic endeavors have always taken a back seat. Now, with kids grown and gone, I can focus on what I like to do best......working with stained glass. 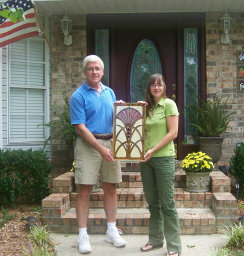 I've been building stained glass for 35+ years. I do good work because of my attention to detail. However, I'm not overly creative and am horrible at drawing. I like the classic designs of the Victorian and Art Nouveau era.....I'm just not a free form kind of guy....I guess it's the engineering background. I like stuff that is symetrical...that makes visual sense to me. 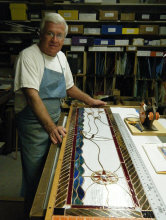 I love working with people who get excited about the glass design we are working on, who want to participate in the process of creating something unique, who get excited that there is somebody out there that will help translate their dreams and ideas into a unique stained glass piece. If you will explore my website, you will see I love to tell the "story behind the story". My clients often send me "before and after photos" of their house with their new glass. Every piece of glass I build is unique, every client wants their glass different and, I think, the story of the evolution of each piece of glass is often very interesting. There's a flag on all 100+ pages of my website. Thanks to those who have defended, and to those who will defend, our freedom! Why do business with me? Normally, I can make designing a piece of glass pretty easy for you. I'm fairly easy to work with and realize most people who contact me aren't sure what they want ...and that we have to explore some ideas together to come up with your perfect design. I'm not cheap.....if you want cheap, order some "made in China" glass from one of those eBay sites. If you want quality workmanship and your design, in your size, and with the colors you want, we can make it happen. 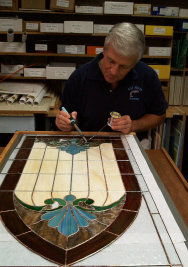 If you're serious about glass, email me and let's swap ideas about your stained glass project. I don't build glass all the time! 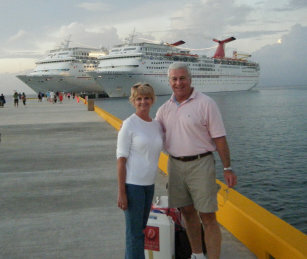 My other passions are cruising with my wife and metal detecting in England! The photo above is from the days of Arts & Crafts shows in malls back in Birmingham (early 80's?). A good friend, Terry James, and I used to set up at all 3 major mall shows each year and we would try to sell enough glass to keep us in glass supplies. The 748 piece Traditional Fruit lamp in the picture is still hanging in my kitchen today. They wouldn't let me dig here!